Torbay Half Marathon – Done! 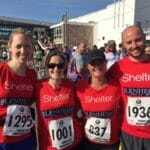 Many congratulations to Helen McGaw, Sharon Kenward, Sally Robinson and Lee Sylvester on completing the Torbay Half Marathon in aid of our chosen charity, Shelter. Despite the heat they all crossed the line and thanks to their efforts we have smashed our fundraising target of £2500 for the year – and we’re not stopping there. With plenty more fundraisers planned we are hoping to be able to donate even more to this amazing charity. Copyright © 2019 Blenheims Estate and Asset Management Limited.